Anglers wishing to fish the Middle Tweed may wish to book accommodation at the Roxburgh Hotel, one of Scotland’s finest country house hotels. Non fishing guests may wish to take advantage of the health and beauty breaks at the hotel. Upper Floors has consistently proved to be one of the top beats on Tweed, with a 10 year catch average of 449 salmon and grilse, the vast majority of which are caught on the fly. 2004 proved to be a tremendous season resulting in a total catch of 690 salmon/grilse – the highest since the mid sixties. Both the records for the best day and best week for the beat were broken in September with 41 salmon/grilse and 114 salmon/grilse respectively. 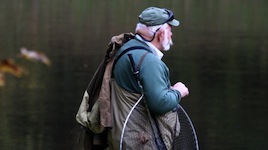 No fishing trip would be complete without checking the latest fishing reports before you travel from the ghillies on the Tweed, including regular updates on the latest catches pages for the Tweed.